The 80's Toy Ark: Greek Charmkins Alert! I get excited about international versions of our favorite American toys. First of all, they are hard to come by. Second of all, they are sometimes difficult to get here to America. Third of all, they are almost always WEIRD! I came across Greek Charmkins the other day and boy are they strange. 1 - They are either knockoffs made after the machinery molds were sold off by Hasbro. This has happened a lot in the vintage toy industry. Companies cancel production on certain lines and so they unload machinery off their books by selling them to a lesser company. 2 - El Greco (an Italian/Spanish/Greek toy manufacturer) purchased the rights to sell these in those aforenamed countries but decided to do it on the cheap, eliminating the paint process. Remember, Italy especially has extremely strict import/export laws. Most toys have to be manufactured in Italy to be sold in Italy. I am not sure if this is the same with Greece and Spain but it makes sense that toys that got manufactured in Italy would be exported to these neighboring countries. We won't know until someone finds one MIP, my guess is that #1 is true. I believe this because often when molds are re-sold a contingency is they have to remove identifying brand characteristics (example: the hearts on Care Bears bums had to be removed when the molds were sold for Angelorso bears). I actually bought several Greek Charmkins and when I get them I will let you know what I find out! Incidentally, I spent a month in Italy last summer and looked HARD for 80's toys. But not hard enough! I didn't find anything. Well, in Florence I found this crazy junk shop and located some Oodles, but didn't buy them. I couldn't speak Italian so it was hard to ask the lady who owned it if she had any 80's toys. But I did visit a lot of regular toy stores! 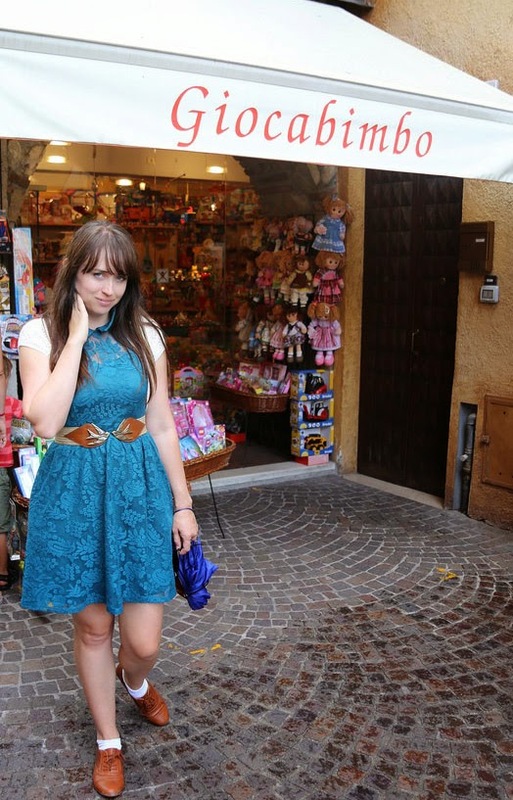 In front of a Toy Store in Sirimione, Italy. It had been raining hard all day! I went around and tried to find more Greek Charmkin pics on the web and ended up finding a few. I started a pinterest board for them. It's going to be fun to collect variations of Charmkins over time. PS - It's fun to be back to blogging! Ooh, those are weird, but some of them on your Pinterest board are kind of cute with their transparent look. Totally off point, but I personally love the G2 My Little Ponies that were made in the UK. I just love their sparkly eyes and slim bodies. I wish I could find them in a good old thrift store or garage sale, but Ebay is probably my best bet. Another totally off point comment, I've found some pretty close off-shoot ponies that remind of the G2s that I'm pretty sure they were made by Remco (aren't off-shoots hilarious too?) and I really like them. Hey, since you're back in the blogging biz, maybe you would like to refresh things up a bit? I would be glad to help out if I can! I can pretty much help with anything from making title images (I do my own and have helped other people with theirs), some blog template coding, or even just a few good tips. Here's a free one, sign up for Bloglovin. Claim your blog on their site and then start following others that you like. I actually follow this blog through Bloglovin and it is how I noticed you've come back. Can't wait to see your next post! Loved this blog post, you made me remind my childhood ♥ I think I still keep several of those transparent charms. PS. Loved your outfit! The dress, belt and shoes are super pretty ♥. MissLadyinLavender - Really appreciate the tips about bloglovin! I will get set up on that, sounds like a great tool. I also kind of adore G2 even though they seem like the red-headed step children of the pony community. I wanted to write a post on this, actually because I have a theory as to why this is. But aren't the babies cute? Cort - Thanks so much for coming and saying nice things about my outfit! Ha ha. I would love to see a pic of your transparent Charmkins!